Suppression is a game mechanic that is currently in use. It acts as a status effect or a condition for Prisoners, generated e.g. through the use of Solitary cells or the presence of Armed Guards. While prisoners are under suppression, they will gradually lower their heads to signify obedience to the prison's law enforcement, will move significantly slower than prisoners who are not suppressed, and are less likely to misconduct - but also less likely to volunteer for one of the Programs. Information on the suppression of prisoners can be found within the save game of any .prison file. Within the file, suppression is saved in points ranging from 0 to 1,440. 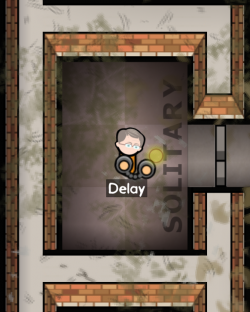 A prisoner's suppressed status can be monitored by hovering the mouse over the affected prisoner. The more plus "+" signs that accompany the suppressed effect, the longer it takes for that prisoner to return to normal. For every 160 points of suppression a prisoner receives, another plus sign will be added, with ten plus signs being the maximum a prisoner can be suppressed. Prisoners lose suppression at a rate of about 1 point per in-game minute, or about 60 points per in-game hour. This means that a fully suppressed prisoner will take about 1 in-game day to recover from the effects of suppression. However, prisoners who are in solitary will not lose suppression until they are removed from the solitary cell. Choosing Rita as a warden doubles the effect of suppression, i.e. the prisoners become suppressed twice as fast. Left armed guard projects suppression from the armory through walls and around the corners into the kitchen. Right armed guard does not project suppression from the yard into the canteen and the holding cell even though there are no brick walls. Armed guards do not continuously apply suppression to prisoners and will instead apply a charge of suppression every 20 - 50 in-game minutes. A single charge will apply about 180 points of suppression against prisoners within a 12m radius of an armed guard. Having multiple armed guards near a prisoner does not amplify the gain of suppression, nor the frequency of charges. The suppressed area is actually any square within 12m of contiguous indoor (if the guard is indoors) or outdoor (if outdoors) tiles, regardless of reachability. So the suppression effect goes through walls and around the corners even if there are no doors between the rooms where the guard and the inmate are. At the same time it does not go from outdoor area to foundationed area even if there are no walls between them. Sniper in the guard tower projects suppression around the corners and through the fence into the narrow alley between the holding cell and the armory. At the same time he does not project suppression into the canteen even though there are no walls separating it from the yard. Snipers occupying a Guard Tower will project suppression to all prisoners within their 30m line of sight. This projection uses the same rules as armed guards which might sometimes be counterintuitive if you take "line of sight" literally. For example it bends around the corners but is stopped by foundation tiles without any walls on them. A suppressed prisoner as a result of being in Solitary confinement. Through the Policy screen, prisoners can get sent to solitary for any of the listed reasons and for any length of time. 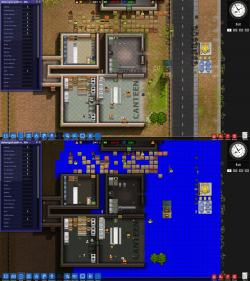 Therefore, if a prisoner gets caught misconducting and gets sent to solitary, they will be continuously suppressed at a rapid rate of 11 points per in-game minute, or 660 points per in-game hour. This means that a prisoner will become fully suppressed in just 2 hours and 15 minutes in-game while in solitary. The solitary cell will not issue more than 1,440 suppression points regardless of how much time a prisoner stays in it. The policy screen can also send prisoners back to their Cell if they misconduct for any length of time. When a prisoner gets placed into their cell by a Guard, they will start receiving suppression. However, the clear difference between their cell and a solitary cell is the rate at which they gain suppression. While in their cell, they will be continuously suppressed at a lower rate of 5 points per in-game minute, or 300 points per in-game hour. This means that a prisoner will become fully suppressed in 4 hours and 50 minutes in-game while in their cell. Just like the solitary cell, once 1,440 points of suppression is reached on a prisoner, it will not accumulate any more points. When a prisoner surrenders during a fight with Armed Guards, he will immediately become 100% suppressed. 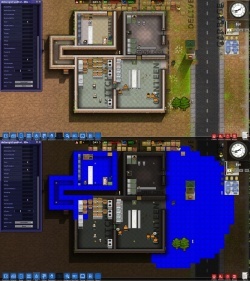 If the Temperature option is activated in the game and showers are not connected to Hot Water Pipes, but only to Small Pipes, showering will add a short suppression effect to prisoners, too. This page was last edited on 21 November 2016, at 13:56.